Mark Johnson Custom Homes is one of the few home builders in Wilmington, NC that are a Certified Aging-in-Place Specialist. The certification is a National Home Builders Association program that focuses on home modifications that will allows elderly or handicapped homeowners to stay in their homes. The program also is aimed at to help middle age homeowners planning for their parents and themselves. On average, people live three years longer if they stay in their own home, they are happier and save money. And most adults prefer aging-in-place. “A Report to the National Livable Communities: Creative Environments for Successful Aging” found that 90% of adults 65 years old and older would prefer to stay in their current residence as they age. Mark Johnson Custom Homes analyzes individual homeowner’s needs with occupational and physical therapists, who work with the homeowner’s doctors, to create a plan of action. With a focused approach and innovative designs, the integrity of the home stays intact, allowing these homes to feel more like their homes, rather than a an assisted living facility. The growing number of candidates for aging-in-place is growing in Wilmington and its surrounding areas, which is why this topic has been featured in a recent Lumina News article. Accommodating a handicapped or elderly homeowner is so much more than wider doorways or handicapped bars. It’s all about learning more about the clients’ needs and planning for the future. For more information on aging-in-place home renovations, contact us today! Wilmington, NC custom home builder Mark Johnson Custom Homes would like to share a testimonial from clients whom we recently completed a kitchen remodel. As the holiday season approaches, we all know how important a functional kitchen is for preparing those wonderful sweet treats as well as cooking the perfect holiday meal. Mark Johnson Custom Homes was contracted to remodel this Wrightsville Beach home by adding footage to the upper floor and converting it to a giant master suite with a large bathroom, two large walk-in closets and a study. In addition, we added a fully waterproofed floating deck and completely renovated the kitchen and living room area. A wall was removed, which exposed the kitchen to the living room. This open contemporary space is perfect for entertaining and the kitchen is complete with a Teppenyaki grill for cooking. To view the construction of this home, click the link below to view the Mark Johnson Custom Homes Flickr page. Wilmington, NC new home builder Mark Johnson Custom Homes has recently installed TRU-VUE FOLD doors in a home we are constructing in the Landfall community. This is a versatile folding door system with an inspired concept for bringing the outside in and extending the inside out, instantly creating an enjoyable space for living or entertaining. The door set comprises three, four or five doors, which all simultaneously fold open together. Simply unlock the set, open the internal drop bolts and the entire unit glides open with a gentle push. Additionally, the door on the end hinges open and closed for easy access and everyday use. To see the progress of the home we are constructing in the Landfall community, click the link below to view the Mark Johnson Custom Homes Flickr page. Open floor plan with 2820 sf, one-story living with bonus room over the garage, spacious rear porches for outdoor entertaining…these are just a few of the features you will find in the Belwood plan designed by Sullivan Design Company. Construction of The Belwood will be completed in October 2012. There is still time to make selections to customize this dream home. Wilmington, NC new home builder Mark Johnson Custom Homes understands the importance of soundproofing certain areas of a home during construction. We would like to introduce our readers to a product that has only been used in commercial building in the past, but is now being used in homes. Non-fiberglass QuietFiber is rated at the highest noise reduction level of “NRC 1.00″ (noise reduction coefficient, higher the number the better). Areas of high noise levels including sound reverberation can be resolved easily and economically by introducing QuietFiber into as much of the area as possible. The amount of noise reduction in highly reflective rooms will be directly relative to how much of the QuietFiber material can be installed into the room. 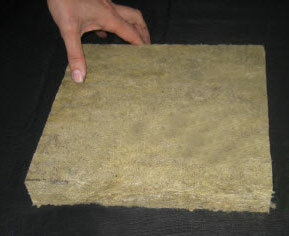 QuietFiber is available in 4 ft. x 6 ft. sheets x 2 in. thick. Ceiling tiles may also be replaced with QuietFiber. Unlike other fibrous materials or fiberglass which does not have the high NRC ratings that QuietFiber has, QuietFiber is “hydrophobic,” meaning it will not absorb nor combine with water. This is an obvious attribute should the material become wet, humid or need steam cleaning. Marine noise reduction applications are endless. Check out how QuietFiber has been used successfully to solve many types of noise problems. Highest noise absorption rating of NRC 1.00 (exceeds fiberglass sound attenuation). Black or white faced version can be used to replace ceiling ties to significantly reduce internal room noise and flanking from adjoining rooms. Highest quality acoustical insulation in the building industry. Hydrophobic, will not combine with water. Full outdoor weather and U.V. tolerant. Easily used in conjunction with a high STC barrier material such as Acoustiblok. Shows significant STC benefit when used in wall or floor assemblies vs. fiberglass. High temperature capable for high temperature sound abatement, i.e. generator enclosures. Comprised of up to 90% recycled material. 100% recyclable. Non-fiberglass. QuietFiber® material is virtually fireproof. Having a U.L. rating of “0 smoke” and “0 flame,” it more than meets any fire code (faced version has flame spread of 25). Both versions tested to ASTM E84. Wilmington custom home builder Mark Johnson Custom Homes is excited to announce that The Angelique was a Silver Award winner during this year’s Parade of Homes that took place April 28 – 29 & May 5 – 6. To view a video of the award winning home built in the Landfall community, simply click “The Angelique” below.